Delhi is both a union territory within India as well as a city and features two very different worlds: New Delhi and Old Delhi. The former, inaugurated by the British in 1931 to serve as the imperial capital, is the nation’s modern capital and seat of government, while Old Delhi is considered by many as the symbolic heart of the greater metropolitan area. One of the most populous regions in the world, Delhi is a heady mix of tradition and modernity, important as both a religious center and India’s busiest international gateway. Its history is as old as the ancient Yamuna River, one of the most sacred rivers in Hinduism and a natural dividing line between New Delhi to the west and Old Delhi to the east. Highlights for visitors to this bustling, vibrant city include its diverse arts and crafts industry, its many magnificent monuments, countless performing arts venues, and its excellent cuisine, including delicacies from every part of India. Delhi is also a shopper’s paradise with numerous bazaars and markets including Chandni Chowk, the country’s most famous commercial area. 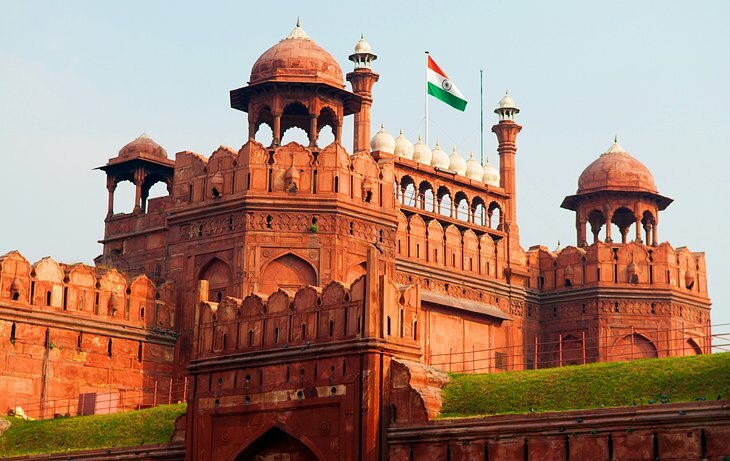 The beautiful Red Fort was built by Shah Jahan in 1648 and served as the seat of Mughal power until 1857. This stunning structure, with its tall, red sandstone walls, covers an area of more than two kilometers, the entirety of which is crescent shaped and surrounded by a moat. The impressive main entrance, the Lahore Gate, is so named as it faces towards Lahore in Pakistan, while the even grander Delhi Gate was used by the emperor for ceremonial processions. Entering through the Lahore Gate, visitors reach Chhatta Chowk, a 17th-century covered bazaar where items such as silks, jewelry, gems, and silverware can be purchased, along with souvenirs and food items. The Naubat Khana within the Red Fort once housed the musicians who played for the emperor, and its fine galleries still contain many interesting musical instruments such as kettledrums, gongs, and cymbals. Diwan-i-Am, the Hall of Public Audiences where the emperor would receive his subjects is also worth seeing for its stunning white marble. 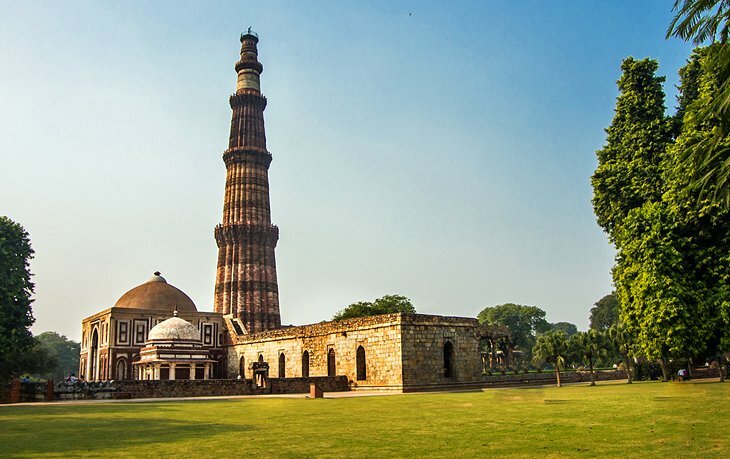 Completed in the 12th century, the beautiful Qutub Minar – India’s tallest minaret – attracts many international visitors eager to climb to the top for its breathtaking views of the surrounding area. This ornate five-story tower rises more than 70 meters and is covered with intricate carvings featuring the history of Qutub along with inscriptions from the Koran. It’s also notable for being constructed of a number of different types of stone (the first three stories are made of red sandstone, while the fourth and fifth stories were built with marble and sandstone). The complex also includes the Quwwat-ul-Islam Masjid, a mosque at the base of the tower; a gateway built in 1310; the tombs of Altamish, Alauddin Khalji, and Imam Zamin; and a 2,000-year-old Iron Pillar, the Alai Minar. 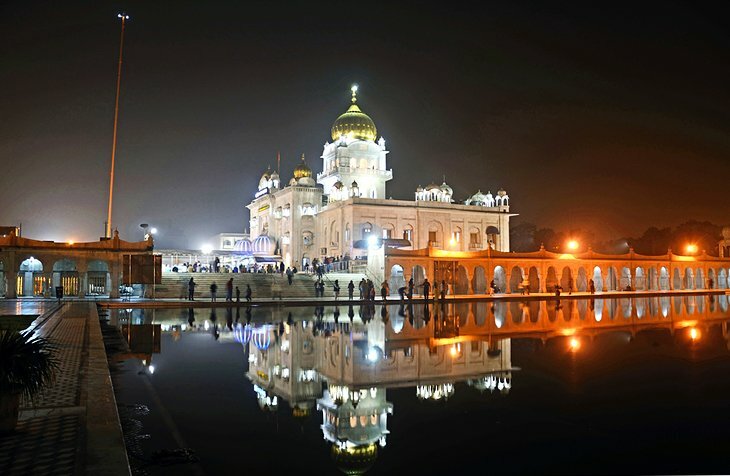 Delhi’s most important Sikh place of worship, the 18th-century Gurdwara Bangla Sahib is near Connaught Place and is well worth a visit. Highlights include its magnificent pool, the Sarovar, at the heart of this large complex, as well as its famous gold dome and flagpole. Also of note is the large temple building itself, along with its art gallery. Visitors are always welcome here, and an excellent meal is available at no cost in the large Gurdwara Kitchen – all that is asked in return is your hair be covered and shoes removed (free headscarves and shoe storage are provided). 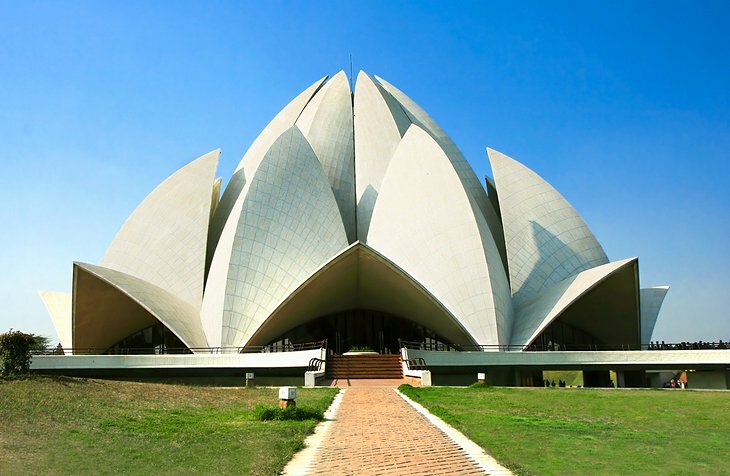 The magnificent Bahá’í House of Worship, also known as the Lotus Temple due to its nine sides and stunning central dome, is an architectural masterpiece. Constructed of white concrete and marble, the entire structure looks as delicate as the flower it resembles. Rising from the surrounding nine pools of water, it almost appears as if it might burst into bloom at any moment. Built in 1986, the temple has since attracted more than 70 million visitors, making it one of the world’s most visited attractions (interestingly, this remarkable place of worship has no idols, religious pictures, or outward symbols of religion). Another modern day temple worthy of a visit is the ISKCON Temple, one of the country’s biggest Krishna temple complexes. 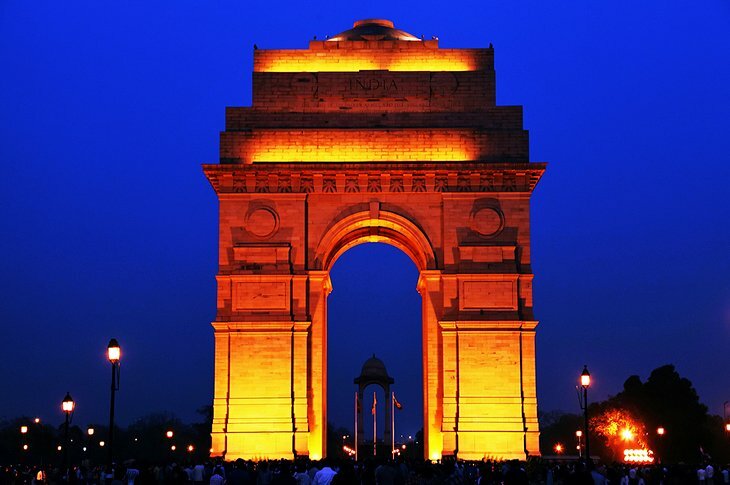 Looking a little like the famous Arc de Triomphe in Paris, the equally impressive India Gate is a magnificent stone arch built as a memorial to Indian soldiers killed in WWI. An eternal flame burns beneath the massive structure, and its walls are inscribed with the names of more than 90,000 soldiers who died in the conflict. Standing on a base of red stone and featuring a shallow domed bowl on top that is occasionally filled with burning oil (usually only on important anniversaries), the structure dominates the parkland around it, an always busy area with crowds of tourists and locals alike enjoying a picnic or simply relaxing. Hot Tip: For a real treat, try to see the India Gate at night when it and nearby fountains are floodlit. 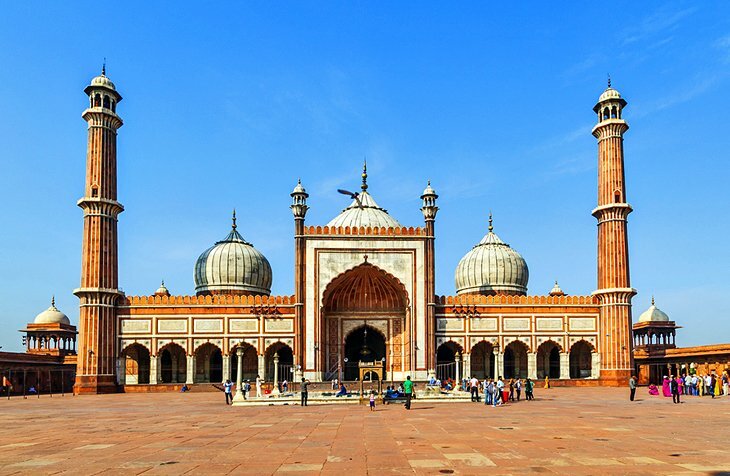 The Jama Masjid is one of India’s largest mosques and was the final architectural feat of Shah Jahan. Completed in 1658, this beautiful mosque features three gateways, four angled towers, and two 40-meter-high minarets built using red sandstone and white marble and attractively alternated in vertical stripes. Visitors can climb to the top of the southern minaret for spectacular views of Old Delhi, and afterwards visit the large central pool used for washing before prayers (visitors must take off their shoes and be appropriately dressed before entering, and non-Muslims aren’t permitted during prayers). Afterwards, be sure to visit Chandni Chowk, Old Delhi’s massive main thoroughfare and a market area dedicated to shopping and eating. Of particular interest are Naya Bazaar and Gadodial, famous spice markets where you’ll see hundreds of items displayed including aniseed, ginger, pomegranate, saffron, lotus seeds, pickles, and chutneys. 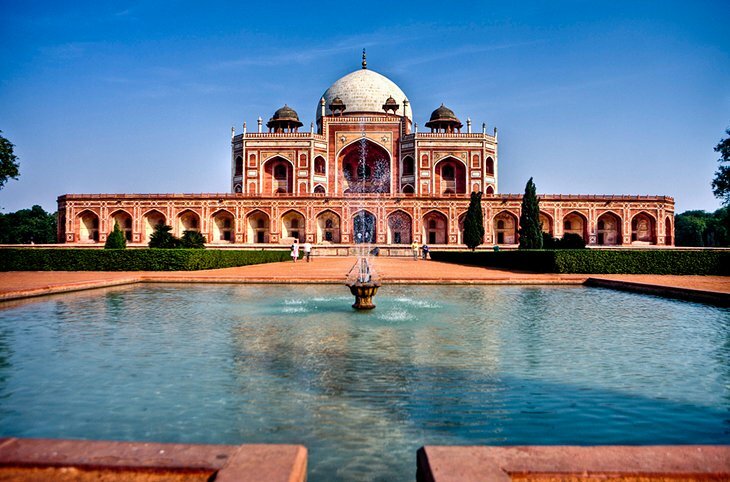 Set in a lovely, large square garden, Humayun’s Tomb is a lofty mausoleum constructed of white marble and red sandstone. It was designed as a prototype of the Taj Mahal in Agra and is an excellent example of Mughal architecture. Built in the mid-16th century by Haji Begum as a memorial to Humayun’s senior widow, the tomb is surrounded by formal gardens and other tombs including Humayun’s barber and the Tomb of Isa Khan, the architect of the Taj Mahal, a fine example of Lodi architecture and octagonal in shape. If possible, try to catch a glimpse of this spectacular structure after nightfall when it’s illuminated. 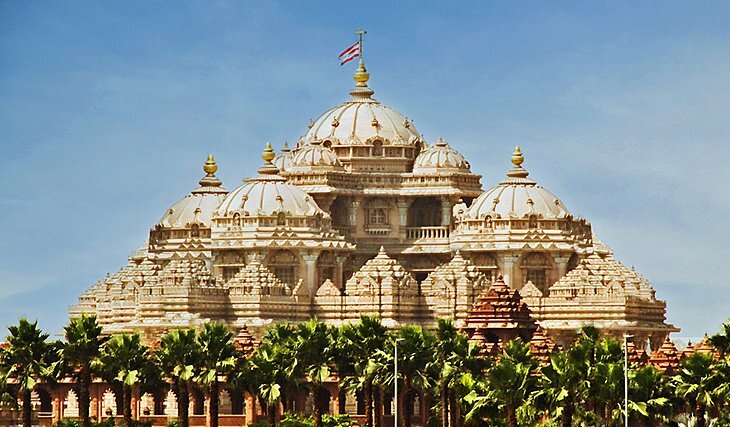 Although only recently complete (it opened in 2007), the splendid Hindu Akshardham temple looks like it could be centuries old. Festooned with intricate and elaborate carvings, this magnificent building attracts countless visitors for its majestic beauty. Highlights include the stunning 43-meter-high main monument with its rich carvings of animals, plants, gods, dancers, and musicians, all made from pink sandstone and marble. Of particular note are the 234 ornate pillars supporting its nine domes, as well as a stunning stone tribute to elephants, the centerpiece of which is a massive 3,000-ton statue of one of these beasts. Other features of interest include a theater showing a movie tracing the building’s construction, a fun 15-minute boat ride depicting India’s rich history and diverse culture, and the spectacular Yagnapurush Kund, a large musical fountain that is a particular treat when lit up at night. 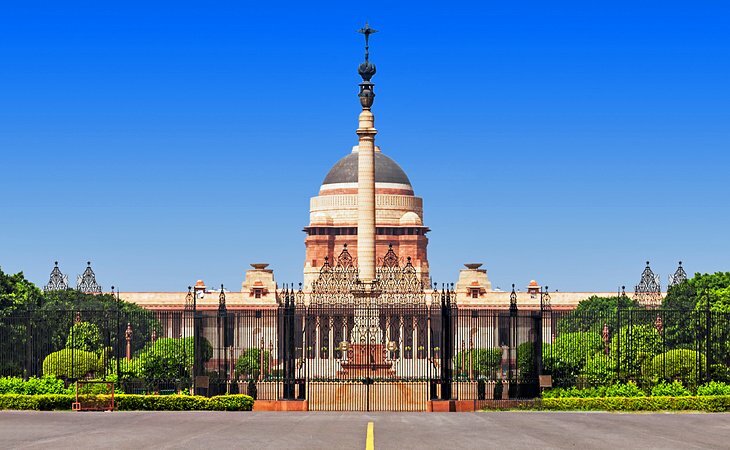 Rajpath, also known as the King’s Way, is New Delhi’s traditional ceremonial boulevard. Running from Rashtrapati Bhavan, the official presidential residence, past such important city landmarks as Vijay Chowk and India Gate all the way to the National Stadium, this broad avenue – flanked by trees, grass, and ponds – comes alive each January 26th during the Republic Day Parade when countless thousands gather to celebrate the anniversary of the country’s independence. At the western end of Rajpath, the President’s Residence (once the British Viceroy’s residence) is undoubtedly one of the most magnificent buildings in Delhi, an eclectic mix of Mughal and European architectural styles that contains some 340 richly decorated rooms. Of particular interest is the new Rashtrapati Bhavan Museum, which offers a glimpse inside the building, along with interesting displays relating to past presidents. 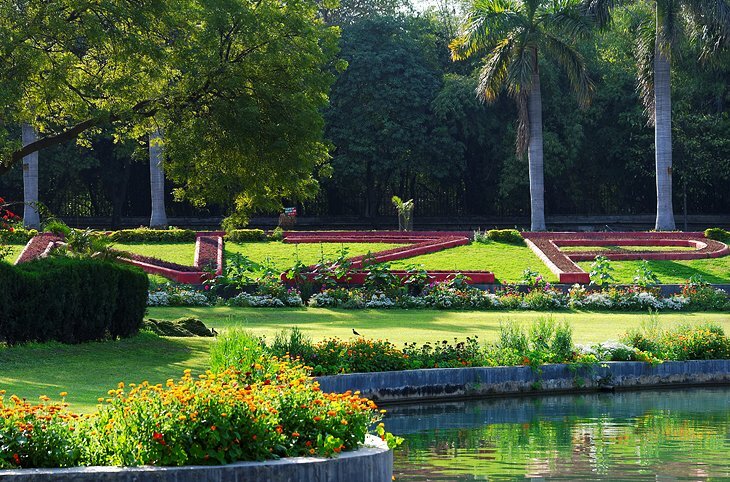 Hot Tip:If visiting in February or March, check out the adjoining Mughal Gardens, a splendid display of plantings surrounding the President’s Residence. Numerous references can be found to Mahatma Gandhi throughout Delhi, a testament to the man’s legacy. Of the many attractions related to the famed leader of the Indian independence movement, perhaps the best is Gandhi Smriti (Gandhi Remembrance), a museum housed in the property where he was assassinated in 1948. Highlights include displays and memorabilia relating to both his life and death, including the room in which he stayed, left exactly as it was at the time, as well as the new Eternal Gandhi Multimedia Museum with historical records detailing his many achievements. A particular highlight is the chance to stroll the very same gardens where Gandhi once spent so much time (the place where the shooting occurred is marked by the Martyr’s Column). 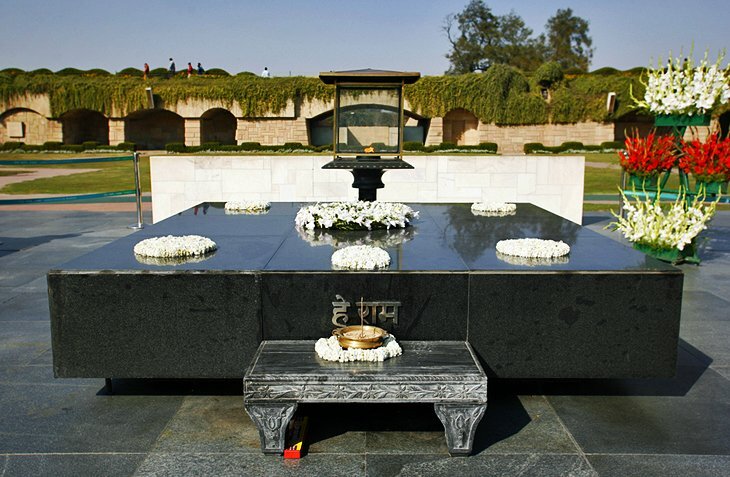 Also of interest is the Raj Ghat memorial to Gandhi just a few minutes’ walk away on the spot where he was cremated. 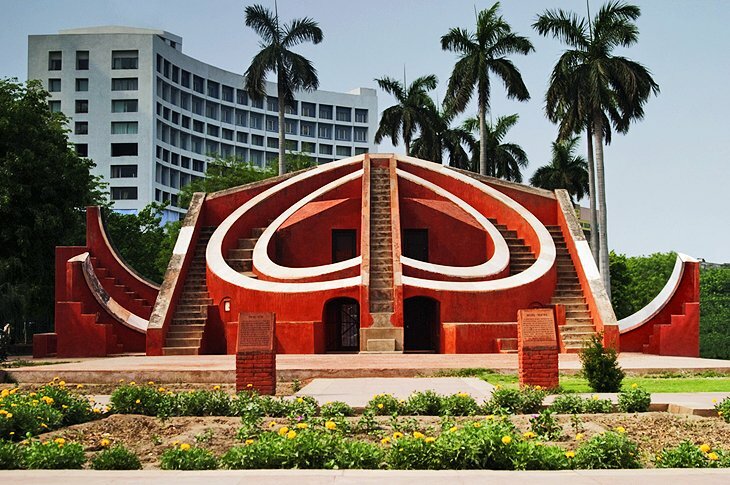 Near Connaught Place, one of New Delhi’s largest and best-known business districts, Jantar Mantar is one of five astronomical observatories constructed by Maharajah Jai Singh I in 1725. Designed to enable occupants to observe the movements of the sun, moon, and planets, this well-preserved historic site also boasts several other old instruments on display that were once used to track the course of heavenly bodies and predict eclipses. Highlights of this remarkable and architecturally pleasing building include an enormous sundial known as the Prince of Dials. Another important politician-related attraction is the Indira Gandhi Memorial Museum, housed in the former residence of this much-revered woman (Indira was the daughter of India’s first Prime Minister, Jawaharlal Nehru, and although a friend of Mahatma Gandhi, was unrelated). Highlights include photos documenting her life and time as prime minister, personal belongings such as the sari she was wearing at the time of her assassination, along with news clippings and letters. An enclosed garden with mature trees and flowering plants surrounds the building, and its pathway is now a memorial, with the spot where she was assassinated clearly marked. Several rooms have been dedicated to her son, Rajiv Gandhi, who was assassinated in 1991. Indira Gandhi’s father, Nehru, is the subject of the equally interesting Nehru Museum and Planetarium (Teen Murti Bhavan) set in his former residence. The museum presents the leader’s life and works, including interesting items pertaining to the struggle for freedom, with highlights including his bedroom, drawing room, and the study housing displays depicting highlights of his career. The galleries of the National Museum, New Delhi – one of the largest museums in India – follow a historical sequence, with all major periods represented. Highlights include archeological finds, along with exhibits of terracotta toys, images and pots, jewelry, seals, bronze and copper implements, sculpture, musical instruments, tapestry, tribal masks, swords, and murals. The most significant gallery is the Central Asian exhibit including silk banners and wall paintings, sculptures, and artifacts related to life along the ancient Silk Route that stretched between Europe and China. Other museums worth visiting include the National Science Centre, one of the world’s largest science centers, and the impressive National Museum of Natural Historywith its focus on the country’s rich flora and fauna. Reputed to be one of the best zoos in Asia, the National Zoological Park was established in 1959 and provides a habitat to some 1,500 animals and birds species. The abundant wildlife on display are representative of all continents, including numerous examples from Africa, Australia, and Asia. Of particular note are the zoo’s numerous chimpanzees, along with hippopotamuses, spider monkeys, zebras, hyenas, deer, jaguars, and tigers. A particular highlight for kids is the underground Reptile Complex, which houses a variety of snakes including the deadly king cobra. 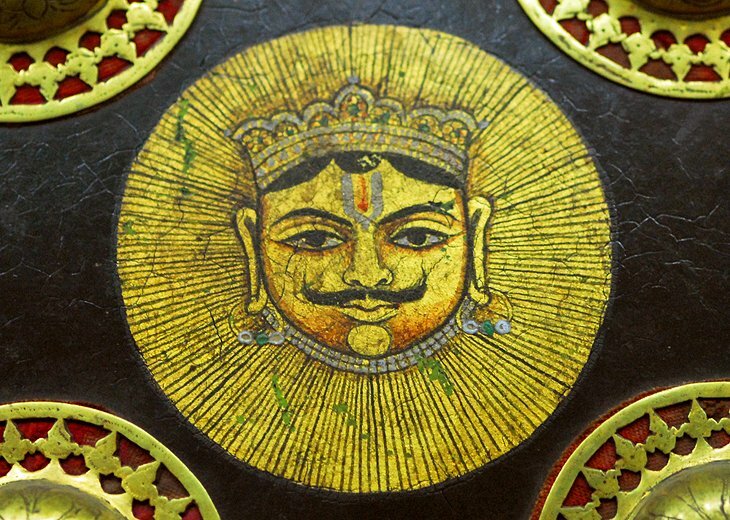 The Crafts Museum – officially named the National Handicrafts and Handlooms Museum, New Delhi – displays a wide variety of traditional crafts from across India. Among its many fascinating features is the chance to watch highly skilled craftspeople demonstrate their centuries-old skills, as well as see large collections of textiles, woodwork, and ceramics. 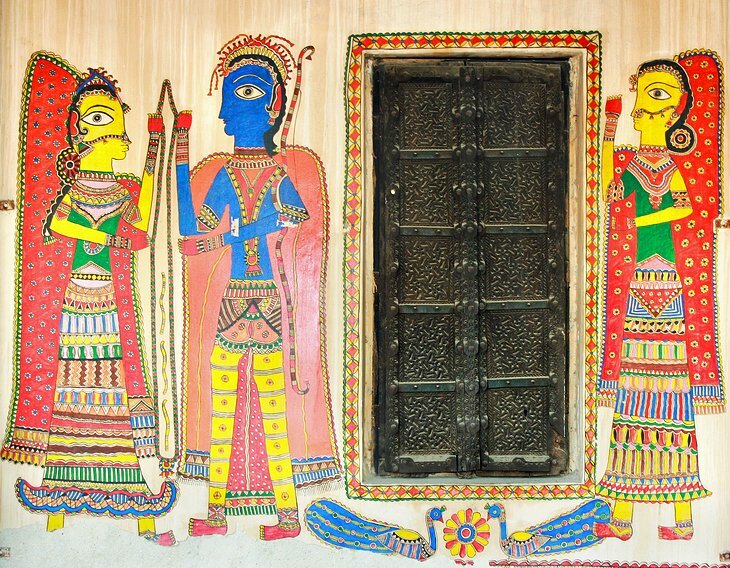 Also of interest are architectural displays of various regional villages, including authentic mud huts and a full-sized wooden haveli (a form of mansion house) from Gujarat decorated with traditional folk art and featuring exquisite woodcarvings, paintings, papier-mâché, and embroidery. Spread across 10 acres, the National Rail Museum houses more than 30 locomotives and several old carriages, most of them quite rare. 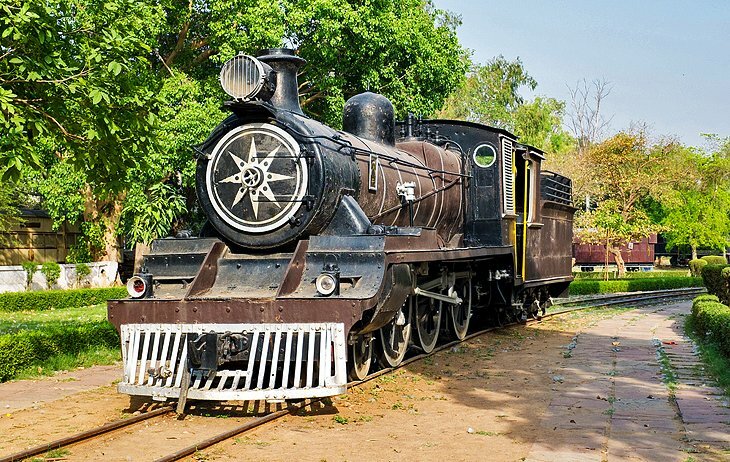 All told, more than 140 years of Indian railway history has been preserved on this fascinating site, including an engine built in 1885 and the Fairy Queen steam engine from 1855. Other highlights include several unique items, such as a collection of saloon cars belonging to the country’s once powerful Maharajas, including the teak carriage of the Maharaja of Mysore, covered with ivory; the cabin of the Prince of Wales from 1876; and the carriage in which the ashes of Gandhi were carried after his assassination in 1948. The skull of an elephant struck by a mail train in 1894 is also displayed. For kids, a ride on an excellent narrow gauge steam train is all part of the fun. The Hauz Khas Complex is a fascinating urban village a little south of New Delhi. In addition to its numerous ancient stone monuments, the entire village is dotted with domed tombs of minor Muslim royalty, who were laid to rest here from the 14th to 16th centuries. 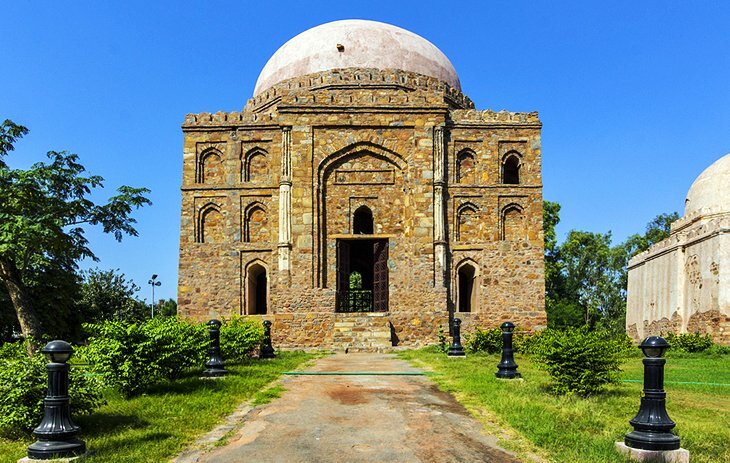 Other highlights include the remnants of an ancient college and the tomb of Firoz Shah, who ruled Delhi in the 14th century, as well as Ki Masjid, a fine mosque built in Lodi style. The site also contains a number of art galleries, fashionable restaurants, and boutiques.